There are many reasons why you might want to transfer your files such as music, videos, contacts, photos, and messages to your Mac from your iPhone. For whatever reason you might want to do this, this article is going to show you the exact steps you need to follow to ensure a smooth transfer of files without using iTunes. 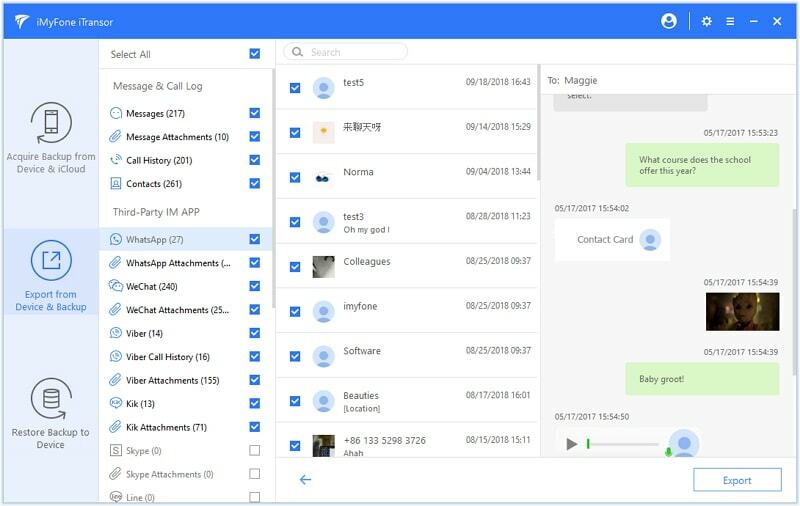 It allows users to export over 18 types of data, including messages, WhatsApp conversations, contacts, notes and more from iPhone to Mac by one click, no need to transfer separately. 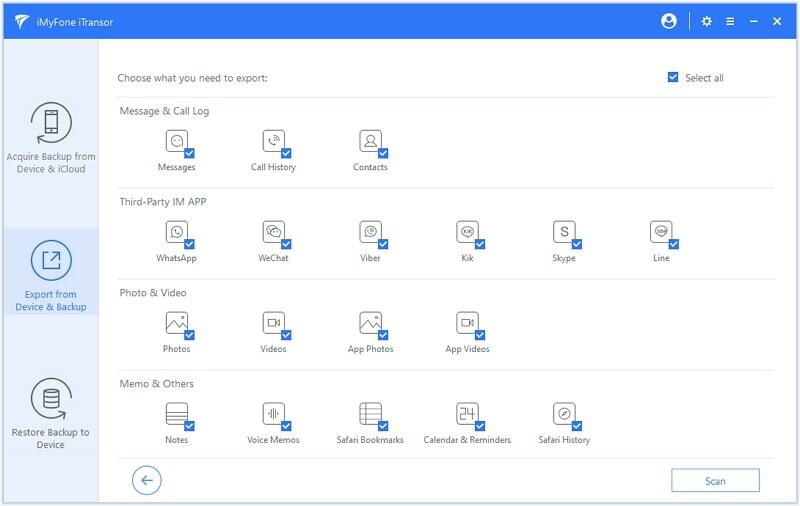 Users can also view and choose what they need only before transfer. Not only from device, the program supports to transfer files from iPhone backups to Mac. It can selectively back up data on iPhone For Free in case any data loss. Compatible with the latest iPhone Xs/Xr/Xs Max running iOS 12, and the macOS Mojave. Step 1. The first thing you need to do is download and install iTransor on your Mac. Step 2. Afterward, launch the program and then connect the iPhone to your Mac. 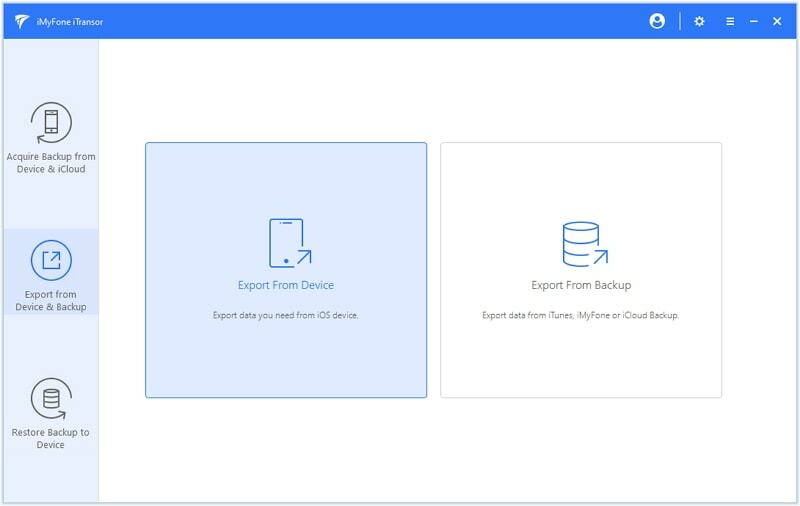 On the panel located on the left side of your screen, select Export from Device & Backup, and then choose Export from Device. Step 3. On the screen that appears, select your preferred types of data that you want to export. When done with choosing, click on Scan and iTransor will commence scanning your device. Step 4. After the scan is complete, you can view the files and choose only what you are interested in. later, press Export and select a location and format you want to save the exported files. You will have successfully transferred your files from iPhone to Mac using iTransor. 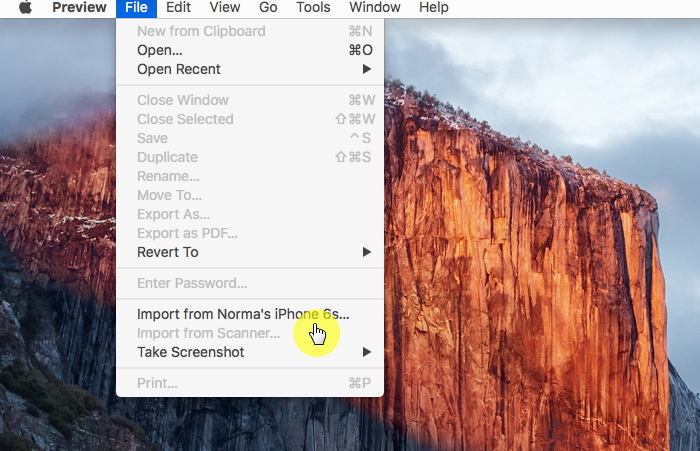 The first thing you need to do is turn on AirDrop on your Mac. Do this by going to Finder > Go > Airdrop, and then turn on Wi-Fi and Bluetooth. 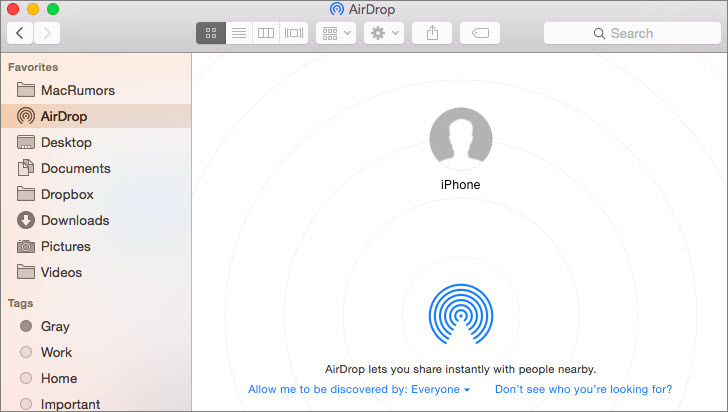 These actions will turn on AirDrop. Next, you will need to turn on AirDrop on your iPhone. Do this by going to Control Center, and then AirDrop. Be sure to set your device discoverable by either Contacts Only or Everyone. When the AirDrop feature is switched on the two devices, you can now go ahead and transfer your files from iPhone to Mac. To do this, just select a file you would like to transfer such as a specific video, and then click the Share icon. From the list that will appear, tap on your Mac's name. This will successfully transfer the file from your iPhone to Mac. On your iPhone, access Settings > iCloud, and then turn on iCloud Drive. On your computer, choose iCloud in the System Preferences, located on the Apple Menu, and then turn on the iCloud Drive feature. When done, you will now be in a position to access your iPhone files using iCloud.com. 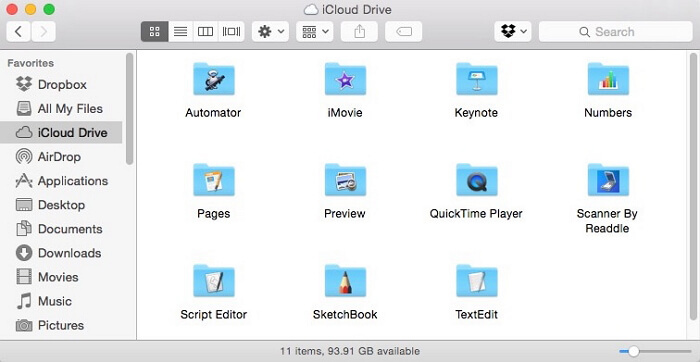 If you use iCloud panel, your files can be found in Documents folder in Finder under iCloud. Connect your iPhone to your Mac via USB. Doing this will automatically launch the iPhoto application. If it does not happen automatically, you can access it by going to Applications, and then iPhoto. 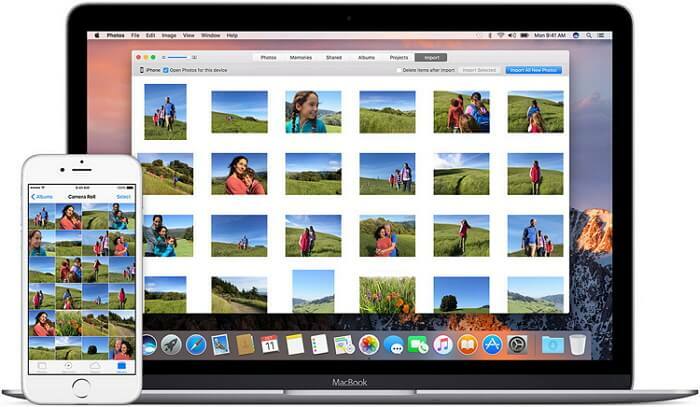 After launching the iPhoto app, you should be able to view all your iPhone's media files. From this point, simply select the ones you want to transfer and choose Import Selected. You can also move the photos and videos by copying the selected ones, and then pasting them on your computer. By completing these easy steps, you will have successfully transferred photos and videos from your iPhone to Mac without iTunes. The first thing you need to do is connect your iPhone to your computer through a USB cable. Go to Applications, and then open the Preview app. After launching the app, go to File Section, and choose import from your iPhone device. A list of files will appear, and you will have the option to either drag and drop your preferred files, or use the open tab to select a location. 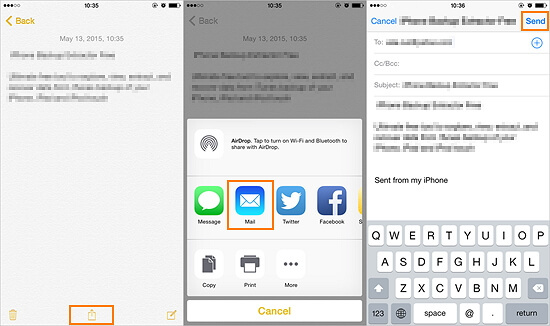 On your iPhone, open the Email application, add an email address, and attach your preferred files. On your Mac, open up Email and download the attached files. This file transfer process is quite easy and all you need to do is to ensure that you have a good internet connection on both your iPhone and Mac. This will enable you to do the transfer smoothly. Using iTunes to transfer files from your Mac to iPhone can be quite annoying, as the app is heavily encrypted and using it might attract many different issues. This is the main reason you should look for other alternatives that will allow you to transfer your files without any problems. You can find our recommended ways to transfer files from Mac to iPhone. Transferring files from your iPhone to Mac not only acts as a good storage option, but also allows you to access your files on a larger screen. This article has provided you with different ways to transfer your videos, contacts, photos, messages, and other files from your iPhone to Mac without iTunes, which can be quite annoying at times. With the in-depth information, you should be able to transfer your files smoothly and in a safe way. But if you want to transfer various types of files from even the latest iPhone Xs/XR/Xs Max to Mac with just several clicks, then definitely iMyFone iTransor is a better choice. Download the free trial version of this iOS data exporter and check what it can offer for you.